The rapper shared footage of the incident on Instagram. On Tuesday, Meek Mill shared surveillance footage depicting what the Philly rapper said was a white man spray-painting "racial remarks" on the side of Meek's grandmother's house. Watch the footage above on Instagram. 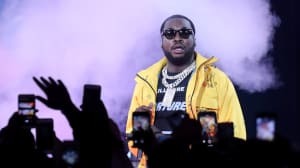 "A white man sprayed a racial remarks on my Grandmom’s house last night in south philly referencing white Privileged [sic]," Meek wrote in the caption before lamenting the area's shifting demographics. "The crazy part is this was a all black neighborhood 20 years ago It was gentrified and now this!" Since his release from prison on bail, Meek has raised awareness for criminal justice reform and systemic inequalities. He released his latest album Championships in November, and recently suggested a follow-up could come before the end of the year.